Now in its 55th year, the 2013 IEEE-IAS/PCA Cement Industry Technical Conference, April 14–18, will feature a mix of educational tutorials and technical papers at the Walt Disney World Dolphin and Swan Resort in Orlando. In lieu of the traditional plant tour on Thursday of the conference, Disney Institute will present a variety of half-day workshops centered on one of the most important resources: human capital. According to Mark Mueller, Chair – 2013 Orlando Organizing Committee, it is time to revitalize the workforce, motivate employees through facilitated discussion, case studies, activities and field experiences to generate memorable lessons. All of which keeps Disney at the forefront of innovation, service and business. 3L&T is a company dedicated to the development of new polymer material technologies to solve tough industrial problems. FlueGard-225SQC stops steel corrosion in equipment like baghouses in the temperature range of 140 to 225 C. For higher temperatures, the company developed the FlueGard-425S; for lower temperatures, the Corrosion- Gard-160S. The company has also created materials that resist corrosion in the kiln shell of cement plants. Founded in 1971 as a subsidiary of The Braime Group, 4B has been an industry leader in developing high quality, innovative, and dependable material handling components for the agricultural and industrial sectors. Its electronics division specializes in level controls, intelligent sensors and safety control systems that prevent costly downtime and minimize the risk of explosion in hazardous areas. Aecometric provides complete package solutions including design, process calculations, in-house fabrication, testing, and after-sales service. The Aecometric Precalciner Burners were developed from the established base design of its rotary kiln burner. The base cement plant precalciner burner design has been modified to allow use as a preheater burner in iron ore grate-kiln systems, a burner for vertical lime kilns, and a warmup burner for cement plants. Aerzen is the world’s leading supplier of positive displacement blowers, screw and rotary lobe compressors, and vacuum pumps. Aerzen Screw Compressor units are are the ideal solution for dry, oil-free and clean compression of air and neutral gases. As high-developed serial products, the screw compressors are used in all branches of industry, and cases of application include the homogenising of cement and stationary unloading of silo vehicles. Air Products has built a reputation for its innovative culture, operational excellence, and commitment to safety and the environment. Having worked with the cement and lime industries for many years, Air Products has helped customers with all types of kilns improve their operations. Its combustion specialists have developed extensive knowledge and practical experience in the implementation of oxygen-enhanced combustion in cement and lime manufacturing. Airgas is the United States’ largest supplier of industrial, medical, and specialty gases and related equipment, safety supplies and MRO products and services to industrial and commercial markets. The company offers delivery, repairs, pump-outs, tank inspection, and preventative maintenance for all ammonia and refrigerant applications. A nationwide distribution network provides delivery reliability, as well as short-notice and after-hours delivery and service. Airtech is an environmental consulting firm that specializes in the sampling, analysis, and monitoring of stationary source air emissions. With minimal impact on productivity, Airtech can help resolve federal, state and local compliance issues for owners and operators of cement kilns, hot mix asphalt plants, materials handling, and aggregate sources. Allied’s approach to refractory solutions in the cement market is unparalleled because each refractory is uniquely manufactured with enhanced mineral additions for optimum performance. A variety of products including low cement, conventional castables and gun mixes exhibit excellent thermal cycling capabilities and resistance to corrosion, alkalis and abrasion. They are specifically designed for rapid installation, shotcreting, pumping, casting and gunning. Founded in 1989, Altech is a leading supplier of Continuous Emissions Monitoring Systems (CEMS) for combustion and process applications. The company also supplies a range of gas analyzers for compliance, process, engine testing and ambient monitoring applications, including multi-gas analyzers, discrete analyzers, particulate monitors, and air quality monitoring systems. Aumund is one of the leading specialists in conveying solutions for the cement industry. From quarry to dispatch, tailor-made equipment is conceived, supplied and installed. Products offered include horizontal and inclined conveyors; belt bucket elevators; circulating bucket elevators; chain bucket elevators; apron feeders; weight feeders; trough chain conveyors; and storage, bunker and silo discharge units. The Avogadro Group is a source testing and consulting firm that focuses on combustion and process-generated air pollution emissions, emissions measurement, emissions control devices, CEM systems, and regulatory affairs. Avogadro provides customers updates on issues that will impact their environmental compliance; regulatory updates on upcoming workshops; and new rules and regulations from local, state and federal agencies. Bulk Conveyor Specialist, Inc. (BCSI), an affiliated company of ADA-ES, Inc., is a leader in bulk material handling equipment and systems as well as water and waste water treatment equipment. A small sample of their products and capabilities are storage silos; belt conveyors, screw conveyors (shafted and shaftless), bucket elevators, drag conveyors and pneumatic conveying; lime/sludge stabilization systems and mixers; and control panels. For more than a century, Bedeschi has supplied raw material handling equipment and services around the globe. Markets include the cement, brick, mining, power and biomass industries. For the cement market, Bedeschi offers preblending storages for any type of raw material as well as coal, clinker and additives; debusting equipment; and, primary and secondary crushing group products. Boldrocchi specializes in designing and supplying process fans and air- pollution-control systems. For the cement and lime industry, the company offers raw mill, kiln primary air, grate cooler, cement mill, coal mill and separator fans as well as kiln, filter, final and clinker grate exhausters. Additionally, Boldrocchi Ecologia applies newly designed bag filters and electrostatic precipitators for purifying process smoke from cement end lime kilns. Bosch Rexroth is one of the world’s leading specialists in the field of drive and control technologies. Under the brand name of Rexroth, the company supplies more than 500,000 customers with tailored solutions for driving, controlling and moving. The company can engineer and supply drive and control technology for single machines, as well as delivering systems for a complete cement plant. A leading online global-network of safety-minded organizations, BROWZ simplifies the contractor and supplier compliance process with intuitive software solutions and a dedicated team of safety professionals. As an independent third-party, BROWZ assists clients in designing prequalification programs specific to their industry, and support contractors in the gathering, data entry and upload of their required data. marketer of standard and specialized dust collector bags, liquid filter cloths, belts, covers and a broad spectrum of filter media. A complete range of needlona-filter media is available for the dedusting of the various production processes in the cement industry. The filter media are characterized by the compact structure and the supporting scrim used. CAI is a premier supplier of quality gas analyzers and systems for use in industrial, environmental, process, health and safety, and automotive emissions measurement applications. The CAI 600 FTIR provides fast, continuous and stable analysis of virtually any gas, which has an infrared absorption spectrum. It’s designed to lower gas emissions by offering a variety of measurements from monitoring kiln operations. C.E.M. Solutions integrates and sells reliable, highly accurate air emissions monitoring equipment. The company also offers a variety of air emissions monitoring and CEMS services designed to assist clients in meeting their corporate, federal, state, and local environmental goals. C.E.M. Solutions serves a variety of industries, including portland cement, biomass, waste-to-energy, electric utility, and independent power providers. CEMSI provides systems, products, and services for the continuous monitoring of air emission sources and industrial process gases and liquids. The company’s expertise includes consulting, integration design, manufacturing, service, repairs and training, as well as on-site performance certification testing. Systems can be designed for either process control or regulatory compliance and complete product support is offered both on-site and in-house. Cemtek Environmental is one of the largest and most experienced Continuous Emissions Monitoring Systems (CEMS) companies in the industry, and a top choice for compliance and non-compliance emissions monitoring systems. The company is a leading supplier of CEMS, CEMS Service, CEMS Upgrades, CEMS Instruments and Process Instrumentation and Gas Analyzers. Cemtek custom engineers each CEMS to meet customers’ needs and permit or monitoring requirements. Since 1925, Christian Pfeiffer has been a guarantor of outstanding components in grinding systems. In the early 1990s, the company began to apply its experience and innovation to plant engineering. Besides the functionality of the components, targets of the company’s mill internals are: long wear resistance, low energy consumption, low maintenance as well as to assure highest availability of the entire grinding plant. Claudius Peters are experts in materials handling and processing systems in the cement, coal, alumina, gypsum and bulk handling industries. The company designs and manufactures stockyards, pneumatic conveyors, cement silos, clinker coolers, cement grinding mills, and coal grinding mills, among other items. Additionally, it is able to project manage and provide process knowledge all the way down the line from initial design, through to supply, installation and commissioning. Continental will undertake parts of a project, serve as a general contractor, and coordinate with consulting engineers, or assume total responsibility for the entire project. The company specializes in industrial buildings, slip form concrete construction, pile driving, structural steel erection, millwright work, marine construction, process piping, material handling systems and contract maintenance. Control Analytics is a representative, distributor, and manufacturer of on-line process monitors, environmental analyzers and systems. Product specialties include Continuous Emission Monitoring Systems, process monitoring, pure water monitoring solutions to major electric utilities, and basic manufacturing clients. Extensive experience with various analyzers, sample system designs, measurement techniques, and regulatory requirements allows the company to provide solution oriented, turnkey systems and components to clients. CMS is the only company in the world to offer complete, integrated corrosion assessment and repair services for tubular air heaters. Assessment services include: visual inspection, air testing, sonic eye testing and tube removal for damage mechanism determination. Repair services include: sleeving and plugging of tubes, tube sheet replacement, tube sheet overlays, partial and full tube replacements, as a result of dew point corrosion, fly ash erosion and external corrosion. CSD Engineers offers engineering, safety and project management consulting services to industry, utilities, and public projects such as infrastructure and transportation. Services offered include business consulting, project feasibility studies, construction cost estimating and constructability reviews, detailed design engineering, life safety (fall protection) services, and construction management. CST Covers provide custom designed aluminum structures and covers for industrial, commercial, recreational, transportation and many other applications. The company’s aluminum domes are custom designed around a bulk storage facilities specific clearance requirements, basin configuration and bulk handling equipment. Structurally efficient and lightweight, they maximize bulk storage capacity, minimize foundation costs and provide dependable protection form the elements while remaining virtually maintenance free. C-TEC is the lead and founding company of CTEC AG and has excelled in servicing the AG industry since 1995 by continuously delivering quality and safety in facility restoration, preventive maintenance or complete facility modifications. Services include silo liner installation and repair, hopper/floor design, crack repair, rupture repair, disaster services (explosions, natural disasters, fire damage, etc. ), and structural roof systems. DALOG offers customized solutions in the field of machine monitoring, machine diagnostics and takes measurement tasks. The company’s core competence is the monitoring of large gearboxes in cement plants. DALOG system detects multi-sensorial measurement variables, such as speed, torque, acceleration, vibration, temperature, pressure and process values. The solution includes on-line monitoring, analysis and reports, user-friendly software, remote maintenance via VPN, and training. DCL was founded with one simple goal: to design and build the most efficient and cost-effective solutions for dry bulk loading – in any industry sector. Areas of expertise include loading spouts, loading spout positioners, aeration equipment, shut-off valves, diverter valves, dust collection equipment, bag and drum filling, level sensors, inspection hatches, and system controls. Diamond Power International, Inc. is a globally acknowledged market leader in all aspects of boiler cleaning and ash handling. For more than 100 years, DPII has consistently provided innovative technologies for power generation, pulp and paper and industrial boiler designs. Areas of expertise include boiler cleaning systems, controls and diagnostics, ash handling systems, vision and camera systems, and field services aftermarket parts and services. Di Matteo offers the cement industry material handling solutions for alternative fuels (tire chips, animal meal, alternative fuels); pneumatic conveying systems for materials that are difficult to handle; bucket elevators for the transport of alternative fuels (height 50 m); fuel systems; and cement storage and transport. The Durag Group is a global provider of measuring and control technology in the field of combustion technology, environmental monitoring, and environmental and process data management. The company's products support all types of industrial combustion processes throughout the world. Durag can also provide solutions for applications in special environments, such as extreme climatic zones or potentially explosive atmospheres. Operating as a fully functional design, fabrication, installation and commissioning able corporation, Dustex focuses on remaining highly efficient and cost effective through the use of pioneered applications by means of access to vast technical archives regarding air filtration, gas-cooling and gas-scrubbing systems. For the cement industry, Dustex offers products for raw and finish mills, material handling, kilns, clinker cooler, among others. In addition to combustion systems, Dynamis also specializes in a range that goes from specific projects for drying systems, handling of conventional or alternative fuels and solid fuel milling, to large contracts like new cement plant projects and integration of equipment from various suppliers. Solutions for the lime, cement and pozzolan market include HHG for cement mill installations, and concept and basic engineering for green field cement plants. EEMC has provided emission testing services for over 35 years, and has established an in depth knowledge of gas streams in a large variety of industries. These insights provide enhanced application compatibility for its gas flow product line (EMRC Division). The EMRC Gas Flow Monitoring System utilizes differential pressure technology. It is capable of accurately measuring gas flow from 5 to 900 ft./sec and temperatures up to 3,000 F.
For 30 years, EnviroCare International has designed and manufactured pollution control systems across a range of industrial and municipal applications for clients worldwide. Each of its more than 1,000 installations is custom engineered and fabricated to meet the exact specifications of clients and their individual applications. The company offers advanced solutions to the increasingly stringent pollution control standards including the Boiler MACT standard and Cement MACT standard regulations. FCT provides innovative process analytical solutions for the cement process. Its patented continuous on-stream mineral analyzer, COSMA, is capable of giving a complete mineral analysis of cement and clinker in real time using XRD and Rietveld analysis. Benefits of a cement installation are quality control; fine control of limestone/kiln dust/fly ash/pozzolans replacement ; plant optimization; and reduction in fringe material. FLSmidth is the world’s leading supplier of cement plants and technology for cement producers. From plant design and project management to commissioning, training and on-site services, the company offers a one source for everything it takes to design, build and operate profitable plants. Forjas Bolívar S.A.S. is a metalworking company with 44 years of experience, specialized in the manufacturing of spare parts for the cement, mining and petrochemical industries, and for the heavy industry in general. The company’s industrial line of products and services consists of bolts and anchor bolts for mill liners and coolers; conveyor chains; round and oval link chains for rotary kilns and elevators; and buckets, shackles and pole hardware. The Fritz & Macziol Group offers – as a system and consultancy firm – a comprehensive portfolio featuring hardware, software and services as well as consulting in selected areas. The companies of the Group develop and sell software and system solutions for public authorities, medium-sized companies and major enterprises. The Group’s VAS system is a process-oriented software solution for the base material industry. For more than 60 years, Fuchs Lubritech has concentrated on the development of special lubricants. Its lubricating grease spectrum ranges from high-grade long-term grease for construction machinery to extremely high and exceptionally high temperature greases for use in extreme operating conditions. Almost all the greases are available in special System Reiner cartridges that are screwed into System Reiner grease guns. This system guarantees the complete emptying of the cartridges. Thanks to its extensive experience and product range, Gambarotta Gschwendt srl aims to provide solutions to any need regarding mechanical hauling of loose bulk material. 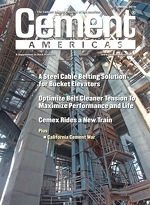 For the cement and gypsum industry this includes conveyors, bucket elevators, screw conveyors and feeders. Gambarotta Gschwendt is able to revamp, modify and enhance elevators of any manufacturer. Moreover, the company is able to supply any spare part for lifting and hauling machines. GE’s Air Filtration team works to help optimize the client’s operation. With more than 40 years of know-how engineering and manufacturing systems and replacement parts, and delivering expert services, GE helps the client keep things running cleanly and efficiently. Clients can acquire filter elements suitable for GE and non-GE supplied filtration systems, and most are available in industry-standard and custom-frame sizes. From protecting and optimizing assets, such as generators, transmission lines and motors, to ensuring secure wireless data transmission and providing uninterruptible power, GE Digital Energy delivers industry-leading technologies to solve the unique challenges of each customer. Intelligent devices that protect, monitor, control & automate the grid, and visualization software that optimizes the grid. Gebr. Pfeiffer Inc. offers grinding solutions for the cement, minerals, ceramics, and utilities industries of North and South America, specializing in MPS and MVR vertical roller mills; MRD ball mills; drying, hydrating and calcining equipment lines; engineering services; test station analysis; erection and commissioning services; spare parts services; and after sales support. Pentair is a manufacturer and supplier of a suite of products and services focused on the provision of solutions to industry and, as importantly, the environment. Whether air, gas or water, Pentair has the solutions and the ability to monitor, record, display, decipher and deliver data meaningfully and in the manner most appropriate to the client. These include industrial components and instruments, and complete turn-key solutions. H2E is a project & risk management, energy management, power and automation engineering firm. It provides extraordinary, yet cost-effective and personal services to clients in various industries including mining and metals, specializing in aluminum & cement. Haver Filling Systems is recognized as a leading manufacturer of diversified packaging equipment for dry bulk materials. The company designs and manufactures material handling equipment to improve the efficiency, productivity, and competitive position of its customers worldwide. It specializes in packing machines for valve bags or open-mouth bags, from automatic bag applicators and ultrasonic sealing stations to high-speed rotating systems. Hazemag is a world leading supplier for impact crushers and raw material processing systems. It offers material handling solutions through a range of products such as: impact crushers (primary, secondary, and tertiary), crusher dryers, drying technology, hammermills, apron feeders, and wobbler feeders. Behind the operation of every Hazemag product is a wealth of experience, backed by a level of partnership and support. Herzog Automation manufactures automatic and manual versions of all machines, such as crushers, mills, presses and fusion machines. It also manufactures samplers for hot meal and clinkers, plus screw, piston, and air-slide samplers. For automated solutions, the samplers are delivered to a lab via Herzog’s plant stations and pneumatic tube systems. Herzog’s range of fusion machines include manual, semi-automatic, and fully automated versions of both gas and electric, high-frequency-type machines. For 30 years, HGH Infrared Systems have specialized in the development of optronic and infrared systems for security, industrial and civil applications. The KILNSCAN infrared line scanner is used for rotary kiln shell temperature monitoring. This system enables to prevent risks of hot spot formation on the shell, to early detect refractory brick fall, to determine coating thickness and to evaluate the kiln thermal warp amplitude. Howden Covent Fans specializes in the custom design, manufacture and testing of heavy-duty industrial and power generation industry fans and blowers up to 10,000 hp, and offer a complete range of sizes and impeller designs. For the heavy process industries such as cement and mineral processing, the company supplies fans, blowers and compressors for process critical applications to meet the most arduous demands. IAC is an industrial design/build, original equipment manufacturer (OEM) supplier of process equipment for APC, dust collection, hazardous gas emission mitigation, pneumatic material transport, and bulk material handling systems. In addition, IAC can provide replacement parts and new equipment components for baghouses and bulk material handling systems. IAC can also supply complete engineered systems, as a total turnkey provider. Intersystems engineers and manufactures bulk material handling products and industrials sampling systems. Several models of Intersystems automatic sampling systems are ideal for the cement industry. These unattended systems ensure a representative and repeatable sample. Samplers and the collection systems are applied in the truck and rail load out areas as they leave the terminal. With more than 30 years of experience, Iteca Socadei is a leading manufacturer of sampling systems, online and at line process control analyzers, centralized automatic laboratories, highly efficient kiln seals as well as high-capacity grinding media sorting machines, specifically designed for the cement and mining industries. Keith provides pallet and bulk material handling solutions through its Walking Floor conveyor. The unique horizontal unloading/loading system handles nearly any bulk material or palletized cargo. Both mobile Walking Floor trailers and stationary Walking Floor bins are used throughout the refuse and recycling, agriculture, energy generation and wood products industries. KettenWulf is a global leader in manufacturing engineered chains and sprockets. With decades of trusted manufacturing and quality, there can be no doubt that safety and reliability are utmost concerns in the design, manufacturing, testing and supply of all Kettenwulf products, such as bucket elevators, reclaimers, and apron feeders. Köppern has become one of a select group of suppliers leading the way in the briquetting, compaction and high-pressure grinding of mineral materials. Of particular interest to the cement industry are Köppern’s roller presses for the high-pressure grinding of raw materials, clinker, and slag, as well as for the briquetting of synthetic gypsum. Lachenmeier Monsun A/S offers a wide spectrum of technology and solutions for bulk handling. The company delivers individually, tailor-made machines as well as complete plants and systems. Lachenmeier specializes in bucket elevators, chain conveyors, screw conveyors, belt conveyors, truck loading systems, storage systems, dust aspiration systems, and intake systems. Lechler is a world leader in engineering and manufacturing spray nozzles and systems. The Environmental Division of Lechler is well equipped to meet the new environmental regulations being imposed on the cement/lime producers here in the United States. Solutions include SCR and SNCR nozzles, spray lances and systems. Lhoist North America, part of Lhoist Group, is a leader in lime-based products and services. Products include limestone, quicklimes, blended quicklimes, lime slurry and hydrated limes. Its calcining facilities receive a continuous supply of raw limestone from quarries throughout North America. The versatile range of products consisting of primary, secondary and universal shredders as well as processing systems for refuse derived fuels (RDF) with groundbreaking and reliable technology create the crucial pre-conditions for Lindner Recyclingtech to meet customer-specific requirements competently. The RDF compact plant is used in the cement industry for processing domestic, industrial and commercial waste for the production of alternative fuels.